Regular expressions have a reputation for being difficult, but, once you start using them, you’ll find that they can really help you do things with your translation tools that would otherwise be impossible. In this presentation we’ll be focusing on the use of regular expressions for searching, filtering and replacing text, but CAT tools also use them for creating segmentation and autotranslation rules, protecting tags, and other operations. A known drawback of translating using Trados is that segments which contain only numbers cannot be opened in the translation memory tool. 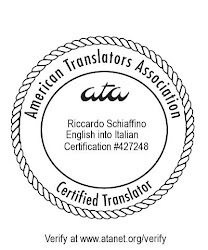 This can be a problem when the document to translate contains tables of numbers: for example, you might be translating English into Italian, and you want to make sure that all numbers are formatted correctly, with a comma to separate decimals and a dot to separate thousands. One of the tasks I regularly use MS Word wildcard searches for is to make sure that index entries in Framemaker's .mif files that I'm translating as rtf (after conversion with S-tagger) are formatted correctly: according to the style guide I have to follow, index entries in Italian should normally start with a lower-case letter (unless they are the name of some program). A technique that I find very useful in these cases is to google within the site. For complex search and replace operations, nothing really beats RegEx (regular expressions) searches, but regular expressions may be very difficult to create. This is probably the clearest enunciation of regex syntax I have come across. Thank you for making a valuable but complex subject easy to grasp for punters like me. Thank you very much for your comment -- I really appreciate it! Tom Fennell here. I came up to you after your presentation at ATA. I am afraid I could not find my note on the site you recommended to get more information on Regex and VBA - could you advise? FYI this is what I found - was this what you were referring to? Regular-Expressions.ino is an excellent reference to all things related to regular expressions. Regarding using regular expressions with VBA (and VBA with MS Word "wildcards"... i.e. MS Word's stripped down version of regular expression search) when we talked at the ATA Conference I was thinking more of the MS Word MVP website (https://wordmvp.com/), where you can find information about VBA, wildcards, and a lot more.